After Alessa’s (Jodelle Ferland) sleep walking becomes dangerous, Rose (Radha Mitchell) takes her to the town that her daughter keeps talking about in her sleep: Silent Hill. Rose loses consciousnesses after a car accident, and wakes to find Alessa gone. Now, she must find her daughter in this town of fog and monsters. I avoid reading other reviews of something before I write my own posts, because I don’t want to have those ideas bouncing around in my head when I’m watching a movie. I found myself breaking my own unspoken rule with Silent Hill though, because I didn’t understand why it had such a low rating. Unlike with the Silent Hill comics, I am, unreservedly, a fan of the movie. It’s just so visually arresting, I find myself watching it at least a couple of times a year. It’s not a perfect movie, that’s certainly true. The plot is so straightforward that it essentially runs like a non-interactive video game; and there are some clunky moments of exposition that are used to fill in the details on topics that probably deserve better treatment. There are also some scenes where the script is so bad, it makes what would otherwise be dramatic moments into the exact opposite (like Radha Mitchell’s little speech to Alice Krige right near the end of the film). But, I can appreciate the strong themes of familial love (and betrayal), and – as someone who actually prefers to watch someone else play games like this, rather than playing them myself – I also don’t mind thinking of Silent Hill as a series of long cut scenes, interspersed with game play that I’m not controlling. That doesn’t bother me at all. I also think that Silent Hill has some pretty gruesome death scenes; particularly one of the latter ones, which made me feel extremely uncomfortable the first time I saw it. 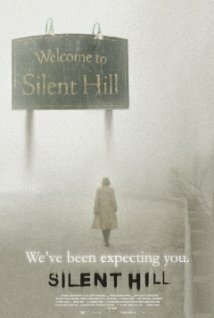 Whether you watch it for the monsters, or for the horror of what people are capable of doing to others, I reckon that Silent Hill gets the job done. It’ll remain one of my go-to movies for some time to come.